We like our beauty fixes to be quick--whitening soaps and lotions that make us fairer in two weeks, whitening serums and creams that lighten dark spots with continued use over time, laser treatment and whitening kits that make our teeth whiter in a few weeks. But there are times that we wish they can be even quicker--think concealer to instantly lighten blemishes and dark spots on your face when you have a hot date to impress. But that's for your face. Imagine if you can "conceal" the yellowness of your teeth just as instantly. NOW, you can. 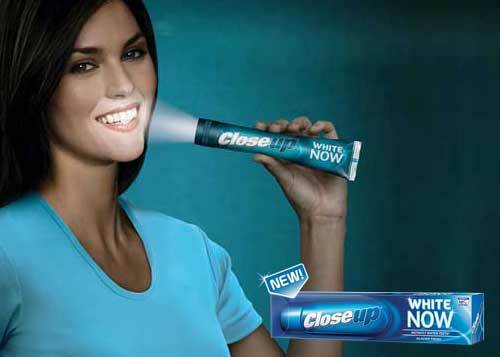 Having a dazzling white smile for that big date is now possible with this toothpaste that promises whiter teeth after just ONE two-minute brushing: CloseUp White Now. It boasts a new blue foam technology that masks the yellowness of teeth, yet is not abrasive nor based on any chemical agents that other whitening kits and toothpastes use. The whitening effect will last for two hours if you don't take in products that stain teeth, like coffee, soda, or tea. It promises not just instant, but long-term whitening effects as well. If you don't believe that, believe this: CloseUp White Now was published in the International Dental Journal in 2009 for its innovation of not only whitening teeth instantly (albeit temporarily) but also progressively whitening them (in the long run), protecting them from cavities, and giving long lasting fresh breath. It instantly became the top or second top-selling whitening toothpaste in countries where it was launched, such as Italy, France, Sweden, Greece, and even certain parts of China. Thankfully, it arrived in Philippine shores just in time to give you the confidence and the sparkling smile you need for your date, your batch reunion, or the many holiday soirees you're soon to grace! Consider this your "makeup" for teeth! CloseUp White Now is NOW available in groceries, drug stores, and department stores for only P65 for the 100g tube.